The most exciting thing to happen to the Cleveland Indians this season isn't on the baseball diamond. The newly patented turbine on Progressive Field's rim could make urban wind farms a reality and help relieve Cleveland's economic woes. 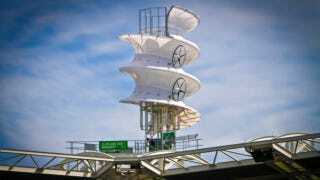 Mounted on a steel base on the ballpark's southeastern rim, the helical wind turbine is designed to amplify airflow and funnel it into four small turbine fans. The turbine assembly is 40 feet tall, 18 feet wide, and it weighs 3,000 pounds. The helix is constructed from 80 vacuum-formed, hard plastic pieces affixed to an aluminum frame. Four off-the-shelf wind turbines rest within the grooves of the corkscrew. "The easiest way to explain it is this: there are two wind turbines hanging on both sides of the spiral," said the corkscrew's creator, Cleveland State University mechanical engineering professor Dr. Majid Rashidi. "When air passes by the spiral, it gently deflects the wind towards the turbines to power them. If the spiral were not there, the air molecules would typically miss the turbines entirely." The array will generate an estimated 40,000 kilowatt-hours a year—roughly four US houses-worth—during its year-long test run. If successful, the design could prove useful in urban and confined environments where conventional long-blade turbines simply can't work. Rashidi found that his array actually amplifies wind speed by a factor of 1.5—10 MPH winds deflect off the structure and push through the turbines at 15 MPH. Even modest wind speed increases will greatly increase the power generated. "Because you are creating an obstacle, you are directly funneling more wind into each turbine with the structure," Rashdi explained. The Department of Energy footed the $1.1 million prototyping bill. The Indians organization hopes to employ it for its energy-generation abilities and also to educate a new generation of baseball fans about sustainable energy. "This is a great opportunity to teach fans about the importance of clean energy technologies," said Brad Mohr, the Indians' assistant director of Ballpark Operations.